Skoda has revealed the facelifted Superb which goes on sale in June. Both the hatch and estate versions get redesigned front and rear ends with a new bonnet and bumpers plus larger headlights and a wider grille. 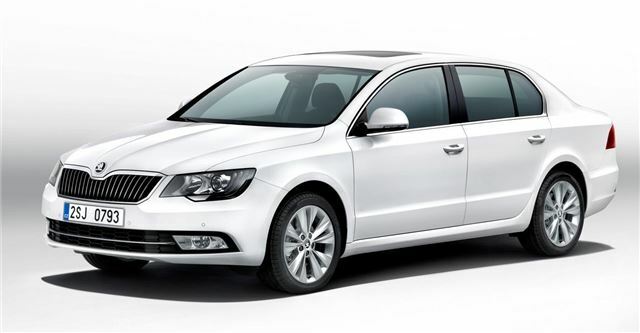 The redesign reflects the new Skoda look seen on the Rapid and Octavia. The changes aren't dramatic but the rear of the hatch looks quite different with new light clusters. The tailgate on the estate has been changed too with a much squarer look, again following on from the Octavia. There are also two new metallic paint colours - Meteor Grey and Moon White along with new alloy wheel designs. Inside there are new fabrics and patterns for the seats. It's not just the looks that have changed though. The engine line-up has been improved with start/stop and energy recuperation now standard on all TDI models plus the 1.4 TSI 125PS. This means better fuel economy and lower emission with the Superb Greenline now averaging a claimed 67.3mpg compared to 64.2mpg previously while CO2 is down to 109g/km - a drop of 10g/km. Other changes include the introduction of a manual gearbox in the 2.0 TDI 140PS 4x4 which was previously only available as a DSG. And a DSG is now offered with the 2.0 TDI 170PS 4x4 which up till now was manual only. Boot space remains unchanged with the estate still capable of carrying an impressive 633 litres which can increase to 1865 litres with the seats down plus the Superb still has the umbrella that's stored in the rear door. It now also comes with the latest-generation Park Assist. The new system allows both parallel and reverse bay parking and assists when entering and leaving parking spaces.